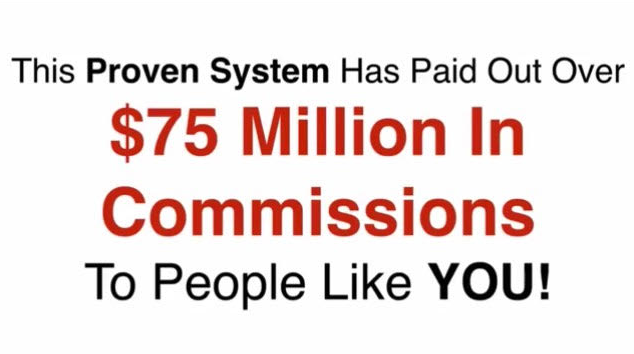 UDC Income System review - Is it a scam or $10,000s in commissions? 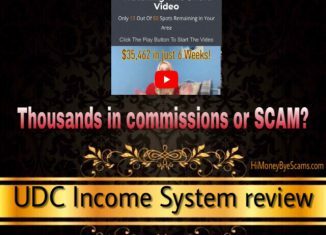 Home > Online opportunities > UDC Income System review – Is it a scam or $10,000s in commissions? UDC Income System review – Is it a scam or $10,000s in commissions? Welcome to my review of UDC Income System! I recently came across udcincomesystem.com and thought I would check out to see what it was about because it looked like a get-rich-quick scheme and thought there might be people who are looking for the truth about this system. In this review, you’ll find what the UDC Income System really is, how it works and whether it can help you become financially free or not. 2 What is UDC Income System about? 4 Is UDC Income System a scam? What is UDC Income System about? Mark Thomas, the man who’s supposed to run the UDC (Ultimate Dot Com) Income System, really knows how to get you excited. He claims to be giving 30 people the chance to get his system that will make them millionaires within 12 months. He makes it seem like it’s not that hard to make money with this system. According to him, making $8,219 by the end of this week is possible. In fact, he claims that you’ll get paid $1,250 if this system doesn’t work for you. It doesn’t require you to have any previous experience or skills. The products you have to sell have already been created. You can make from $1000 to $10,000 in commissions per sale. Once it’s set up, it makes money on complete autopilot. It has generated over $75,000,000. You’re going to be assigned Mark’s personal sales team that will close the sales for you, so you will not have to do any selling. You’re going to get a one on one personal mentor who’s said to help, educate and guarantee you success. He keeps talking about how this new system will solve all your financial problems and will give you the lifestyle you’ve always wanted. After watching the long sales video (it lasts like 37 minutes), I thought this system was way too good to be true, and knew that the sales video is full of misinformation and things you need to know that they don’t tell you about. I found out that there are two pages for the UDC Income System: udcincomesystem.com and udcincomesystem.net. Did you notice there’s no logo for this system? The truth is that UDC Income System is not the real system here. Depending on whether you came across udcincomesystem.com or udcincomesystem.net, you’re going to get into one program or another. What these both programs have in common is that they work in a similar way. They both are high-ticket MLM programs, that’s why the same sales video has been used for both. Now you might be wondering, if UDC Income System is not the name of the real system, what’s the real name? Jeff’s 6 Figure Business System and Aspire. This system is supposed to cost only $49, but the truth is that it costs much more than that. The $49 initial fee is just to get you started, but they do not tell you that you have to spend more than $49 to earn those thousands of dollars in commissions. Remember that they claim they have high-ticket items that not everyone is eligible to sell? These high-ticket products are the ones you’ll have to puchase in order to be allowed to make thousands of dollars. Programs like this one offer high-ticket packages for you to buy before you can promote them, and they also have monthly fees to pay too. If you’re wondering how much you’ll have to spend on these high-ticket packages, know that it’s thousands of dollars. And then, after investing in those packages, you’ll have to get other people to join the 6 Figure Business System and get them to buy the same products & packages you’ve purchased. And what about the personal mentor you get after joining? This person will be there to get you to buy and upgrade to the most expensive packages and levels in order to make money off your purchases. 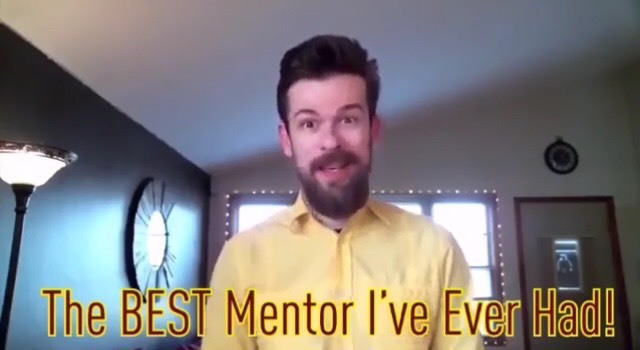 Your personal mentor a.k.a. your sponsor is also your sales team that will help you get your new recruits to spend thousands of dollars so you can make the huge commissions. And then, you’ll have to teach your recruits to do the same that your personal mentor has done to you. You’ll have to teach them to get new recruits and will have to help them make sales in order to make money off their sales. It’s a never-ending cycle just like it happens in other MLM companies. Aspire is the cheapest membership level of Digital Altitude, a high-ticket MLM program that has recently got sued by the FTC for over $14,000,000 in fraud. It worked the same way the 6 Figure Business System does. The marketing training they provided had good quality but it was focused on getting other people to purchase the Digital Altitude packages. The Aspire membership costs $37 per month, but then in order to make the big bucks, they tried to make you spend over $50,000 in all the highest packages. It was way too much and there have been many people who’ve lost money to this program. I personally don’t like the fact that they claimed you could make a 6 Figure income in 90 days, something that most people who got into it didn’t achieve. Seriously, who has thousands of dollars laying around? Most people don’t, so they got told to do things like getting loans or selling their cars in order to purchase the pricey DA packages. Because of this, most people who purchased DA are struggling more than before they got into it. Is UDC Income System a scam? I personally consider UDC Income System to be a scam because it’s not a real system itself. Apart from that, the sales video contains many red flags and sales tactics that are unethical. Let’s see what you need to watch out for whenever you come across a page like udcincomesystem.com. Mark Thomas was supposed to be the person behind udcincomesystem, but when you know what programs they want you to get into, you find out Mark Thomas is just an invented character. The owner of Digital Altitude is Michael Force and the owner of the 6 Figure Business System is Jeff Lerner, so I guess that udcincomesystem.com and udcincomesystem.net was created by an affiliate of those programs. 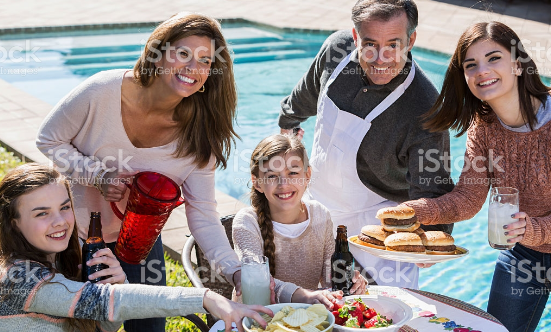 Another way I got to know that Mark Thomas is a fictional character and the story he tells is fake, is by doing an image search. This is something I keep seeing in scam videos most of the time. The people who appear in the sales video and claim to have made thousands of dollars in a short amount of time are paid actors. 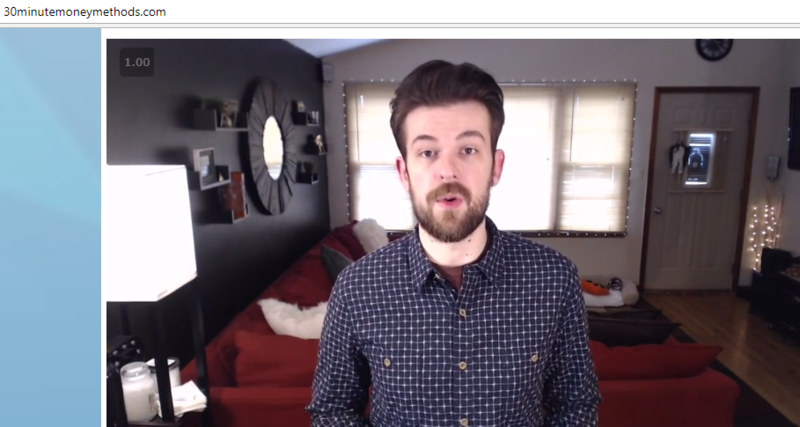 I’ve lost the count of the times I’ve seen this guy in scam videos. He’s apparead in the FreeAdCashSystem scam, 30 Minute Money Methods… You can observe the background is the same in all videos lol. In conclusion, none of those people who appear in the udcincomesystem.com sales video have purchased the 6 Figure Business System or Digital Altitude. All their results are invented. The disclaimer says the truth about this “magical” system. As I highlighted in the picture above, the average person who follows the training gets little to no results. If you think about it, this is what happens in most MLM companies. The ones who get to profit the most are the ones at the top, and the people at the bottom make little to no money. 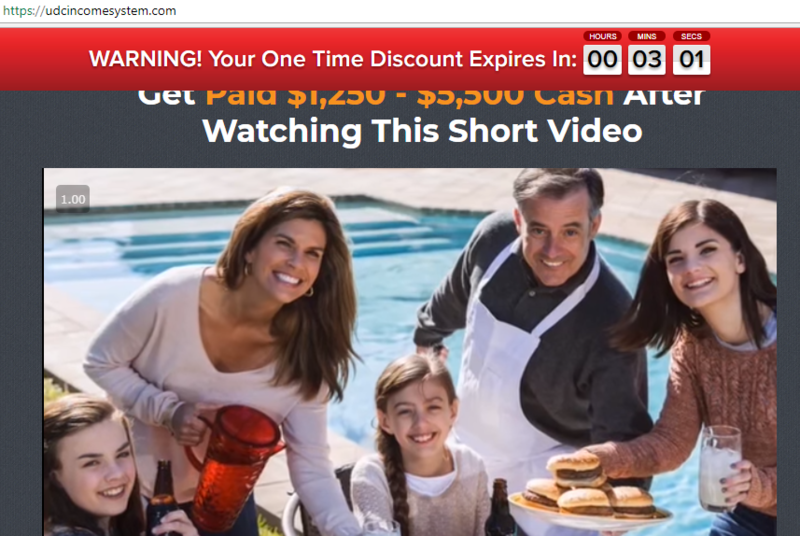 As long as they provide a disclaimer where the truth is stated, they can say whatever they want in the sales page like “Get Paid $1,250 – $5,500 Cash After Watching This Short Video”. They will not be liable for the results of the people who buy into it. Whenever you hear someone claim their system is completely automated, start suspecting. In the online business world, there’s no system that you can set up and make money without having to do anything. When it comes to these high-ticket MLM programs, you’ll constantly have to get a lot of traffic in order to make sales. The way the people involved in these programs get traffic is by doing paid advertising, something that can be risky for you if you’re just getting started or are on a low budget. MLMs work in a way that you have to constantly find people to buy into it. You can’t just get a few recruits and expect them to do all the work as you’ll have to help them make sales as well. The final decision is up to you, but I personally don’t recommend that you fall for udcincomesystem.com and purchase the 6 Figure Business System because it’s so risky. None of these get-rich-quick schemes or “done-for-you” systems will give you any long-term financial success because they require you to invest too much and getting others to do the same is not that easy. Not to mention that most of these programs end up shut down like it happened to the Empower Network and has recently happened to Digital Altitude. The good news is that you don’t need to get involved in any MLM in order to earn a full-time income online. I remember some years ago when I got involved in a MLM company and didn’t have a good experience, but thanks to that I found out about the business model that I now use to make money online. This business model doesn’t require you to make any crazy initial investment or be constantly trying to get recruits. It doesn’t even require you to create your own products and paying to get traffic is not a requirement either. The platform where I got started back in 2016 has taught me how to build an online business from the ground up and has given me a way to earn consistent income month after month. I believe you can do the same if you’re committed to putting in the work and time and have the proper step-by-step training, business tools and support. You’ll learn how this business work, what you need to make this work, how to get started for free and more! Looking forward to seeing you in the right way to earn money online! I hope this review has given you the answers to the questions you had concerning the UDC Income System. If there’s something else you want to know or you want to share your opinion, don’t hesitate to leave a comment below and I’ll get back to you ASAP. Ultamaking.com review – Scam or $500 per day? Is Einstein Success Code a scam? Truthful review here! Is Employthere.online a scam? Yes, honest review here! Cash Website Success SCAM exposed – Review reveals UGLY TRUTH! Club Shanghai review – SCAM? A new name for an OLD PRODUCT!